I have a riddle for you: Everyone has some, but wants more, and some people think they have less than others do. What is it? I’ll give you a hint: Albert Einstein and children have this in common. Okay one more hint: Some people find it in the shower. Creativity was present through major human accomplishments that changed the course of history: the formation of revolutionary inventions like the wheel, the origin of new concepts like the theory of relativity, and during the introduction of new art forms such as cubism or jazz. Today, as technology advances at such a rapid pace, it’s increasingly clear that creativity is thriving; also that creativity and its cousin innovation never sleep. Constant competition to advance the world as we know it has made creativity that a more sought-after attribute in employees, in employers, in medicine, in music, in design, in entertainment -- in everything. So we know it’s prevalent and that we all want more of it, but we have questions. Where does creativity come from? What’s the science behind it? Are some of us more creative than others? If so, can we learn to be more creative? And if we are in fact born with it, is creativity lost somewhere along the journey from childhood to adulthood? Like many matters of the brain, creativity is a vexing puzzle even to the world of medical science. However, it’s an exciting time for the science of creativity with truly groundbreaking pieces of the puzzle continually surfacing. Before we dive in, here’s a disclaimer: I am not a scientist. Not even close. In fact, I myself had some misunderstandings about creativity before I began my research. This post is an attempt to explore what we know about creativity, starting with one indisputable fact: creativity is vital to human growth and progress. Given the complexity of the subject, psychologists have tried to break creativity into parts in an effort to understand it better. 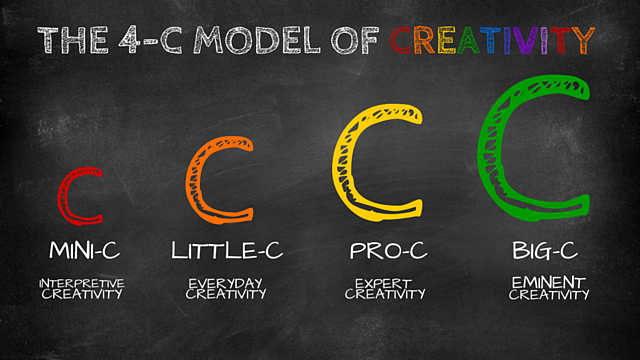 The Four-C Model of creativity was developed to help “broaden the concept” and differentiate the levels of creative expression. In the words of Beghetto and Kaufman, “The Four-C Model provides a framework for including creativity in the curriculum and helping students develop their creativity to higher levels,” which I’ll get into a little more later on. 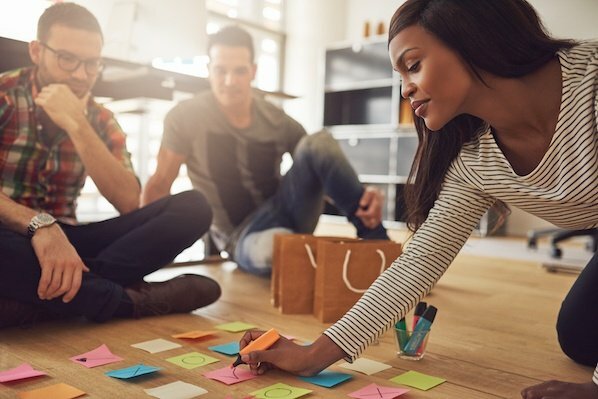 “Little-c” creativity refers to everyday creativity and problem solving, such as coming up with a new recipe in the kitchen, finding a new way to organize your home, coming up with a new project for work, etc. “Big-C” creativity refers to revolutionary creativity that changes the way people think, feel, live, etc. Overall, creativity is pretty all encompassing. It’s a human attribute, a function, a prerequisite, and an intricate process. While Little-c creativity can be attributed to a productive, successful, and enjoyable day, and Big-C creativity to moving humanity forward, one might argue still, that Little-c creativity facilitates the Big-C creativity. The greatest innovators of our time didn’t consistently have moments of Big-C creativity. Their days were likely filled with Little-c moments all consistently connecting together to lead up to that one, brilliant Big-C revelation which they then worked hard to bring to life. In a fascinating presentation at the Asian Art Museum of San Francisco in 2011, neuroscientist Dr. Vilayanur S. (V.S.) Ramachandran uses the neurological phenomenon synesthesia to explore excess connections in the brain as they relate to creative individuals. Synesthetes, or those possessing the synesthesia trait, most commonly associate particular numbers and/or letters with colors (referred to as color-graphemic synesthesia), but the condition may also include associating words, days, or months, with - not only color - but specific tastes and sounds. About 1 in 2,000 people in the world have this synesthesia. While not all creative individuals are synesthetes, synesthesia’s prevalence in creative individuals is almost as curious as the trait itself. Synesthesia is not a new discovery, yet it’s being discussed more and more in conjunction with creativity and the creative brain. With all this information, one starts to wonder, are synesthetes typically more creative because they’re neurologically programmed to understand connections between things that not everyone else can see? It certainly doesn’t hinder creativity any. Knowing that maybe we’re all synesthetes to some extent really opens up questions about the science of creativity. For highly creative individuals who don’t classify as synethetes, are there still excess connections in the brain that aren’t as apparent as those who relate the color blue to the letter ‘J’? The brain is still a mystery, but studying these excess connections could certainly open up more doors toward understanding precisely what’s happening in the brain during the creative process. However, it’s worth noting that seeing the connections is one thing, ensuring that an audience gets value from those original ideas and concepts is another. Some of the greatest artists and innovators of our time were deemed crazy because their divergent thinking and ideas didn’t coincide with the rest of society’s at the time. Where Do “Original” Ideas Come From? Understanding that connections are constantly happening in the brain is important to understanding the science of creativity -- but ideas have to come from somewhere. Where are these unique, original ideas coming from? And are they actually completely original? I’m sure you’ve had someone at some point in your life tell you that no ideas are completely original, but culminations of other ideas. That has some truth to it. Ideas don’t just fall out of the sky, they come from knowledge you already possess. So while intelligence does not directly influence creativity, I think it helps it along -- if you possess more knowledge to make connections to, you might appear to have more creative ideas. In a video for PBS Off Book, a web series exploring art, internet culture, and people creating it, filmmaker Kirby Ferguson urges people to let go of this romanticized idea of “originality.” He agrees that ideas don’t actually come out of thin air; in your subconscious you were still processing all these influences from memories, education, experiences, etc. He also mentions that humans create new ideas by copying, transforming, and combining other ideas (take existing ideas that nobody would have thought of combining, and connect them; make them work). Even the printing press, as Ferguson explains, didn’t just come out of the blue. Gutenberg used a remix of copying, transforming, and combining ideas to create something completely new and innovative. First, you have to throw all your previous notions of the right and left-brain out the window – consider this myth debunked. Creativity is not strictly confined to the right side of the brain, nor is analytical thinking only borne of the left. The brain is an orchestra working together harmoniously to perform the imaginative symphony that is creativity and ideation. A symphony is broken up into sections, or movements (many times, four), and requires several sections of an orchestra to play together in order to bring the piece to life. 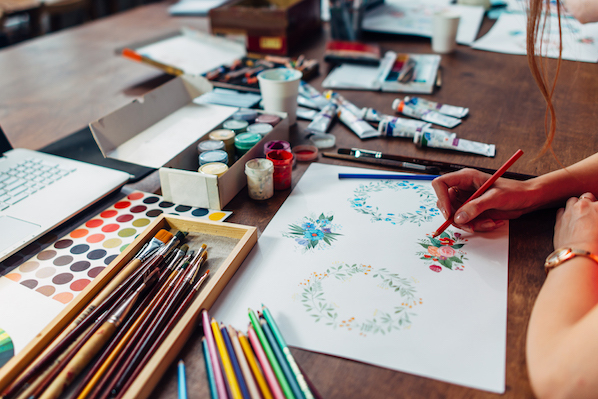 In a similar fashion, several sections of the brain must play their part in harmony over the course of four “movements,” or stages of the creative process, to conceive an idea and bring it to life. So what sections of the brain comprise this creative orchestra playing its four-part symphony called Creative Cognition? Like creativity itself, the brain is infinitely complex. To “simplify” this squishy organ, neuroscientists noticed parts of the brain working together during different activities. 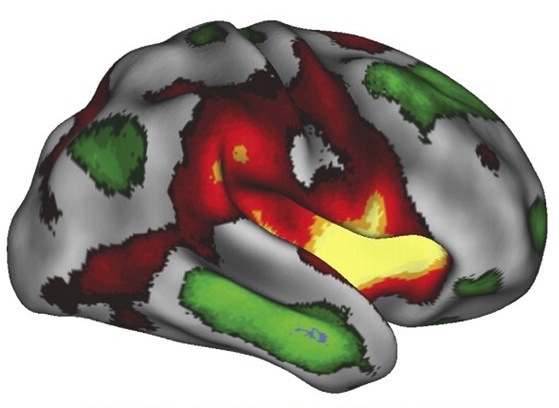 These “hubs” in the brain connect with other “hubs” forming networks. Without getting super sciencey, there are three large-scale networks of the brain that work together throughout the creative process to achieve creative cognition. I think it’s important to identify these before getting into the process itself (with a lot of help from cognitive psychologist Scott Barry Kaufmann, in his article The Real Neuroscience of Creativity for Scientific American). These executive functions are involved anytime you require attention and focus. When you’re concentrating on learning something, like listening to a lecture or trying to solve a problem that requires you to dig deep into your working memory, the parts of your brain communicating here are the lateral or outer regions of the prefrontal cortex and areas toward the back of the parietal lobe. This network is responsible for - you guessed it - imagining, mind wandering; when you’re not involved in a task, this part of your brain is likely in use. Imagining things like the future or alternate perspective and hypothetical situations in the present. The imagination network is also involved in social cognition, like being aware of the feelings or thoughts of those around you. The salience network basically keeps the connection alive between external events and your internal consciousness. If you think you’re not good at multitasking, you actually do it all the time with this network of your brain! Whenever information is salient, or significant to solving a current task, this network will pass the internal recognition to the forefront. 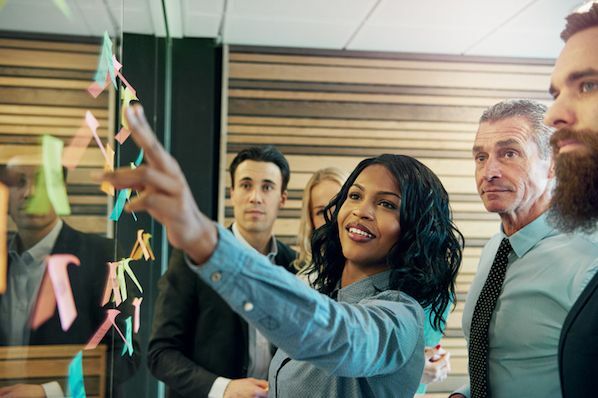 For example, you’re in the middle of a brainstorming session and a team member says something that clicks with a problem you’ve encountered, you’re going to take that recognition and express it vocally to the team. Your brain is hungry for knowledge, so feed it. Think of your creativity as a perfectly healthy baby. She has all the potential in the world to grow up and be extraordinary, but you need to nourish her and give her all the necessary learning tools to help her achieve greatness. The preparation phase is actually your brain learning, storing the materials, and making subconscious connections to knowledge you already possess. The more you learn, the more unique connections you can make. During this stage, we see a lot of activity in the executive functions. When you’re consciously trying too hard to come up with a unique and special idea, you might be concentrating on the wrong thing. So hand the keys over to your brain and let it drive for a while. Studies have attributed many great ideas to the wandering mind. Your brain is still making those connections, and the important stuff you’re trying to figure out is still very present in your mind. Imagine your brain is an assistant that knows you better than anyone else, so he knows your dilemma and he knows all the good material that you have stored in your files. Just relax, let him get to work, and he’ll come back with exactly what you were looking for. Your brain will take better care of you than you think. It knows what’s important to you, and it’s searching through its archives to find the connections. This is the moment your assistant comes back and throws that great idea in your face with all those connected pieces you’d been looking for, causing you to leap out of your chair and scream, “EUREKA!” And, thus, jolting you back to consciousness to get the idea in action (hopefully). Imagine this familiar situation: you’ve just found an insanely comfortable position in bed and are about to drift off to sleep. But then something hits you; that stroke of brilliance you’ve been looking for. At this very moment, you have two options: either muster up the strength to email yourself or write a note with one eye open, or run the risk of losing your creative ideas to the night. And it’s not only right before you fall asleep that this tends to happen: long walks alone, a solitary drive in the car, and, famously, in the shower, have all been attributed to inopportune “lightbulb moments” – this is an example of experiencing the illumination stage. Here’s where your conscious mind can take that beautiful, shining lump of clay (your special idea) and mold it into the perfect statue. Rarely do you jump out of the shower knowing all the steps you need to carry out your special idea and bring it to fruition. During the verification stage, you’re taking your stroke of brilliance, verifying that it’s a realistic idea, and building the framework for how it will come to life. In the daily stream of thought these four different stages constantly overlap each other as we explore different problems. An economist reading a Blue Book, a physiologist watching an experiment, or a business man going through his morning’s letters, may at the same time be “incubating” on a problem which he proposed to himself a few days ago, be accumulating knowledge in “preparation” for a second problem, and be “verifying” his conclusions on a third problem. Even in exploring the same problem, the mind may be unconsciously incubating on one aspect of it, while it is consciously employed in preparing for or verifying another aspect. And it must always be remembered that much very important thinking, done for instance by a poet exploring his own memories, or by a man trying to see clearly his emotional relation to his country or his party, resembles musical composition in that the stages leading to success are not very easily fitted into a “problem and solution” scheme. Yet, even when success in thought means the creation of something felt to be beautiful and true rather than the solution of a prescribed problem, the four stages of Preparation, Incubation, Illumination, and the Verification of the final result can generally be distinguished from each other." When I was young, like many of us, I was often told that I was extraordinarily creative. I never became an artist like I thought I would, but I did recently reaffirm my belief in my own creativity. But had it really gone anywhere? 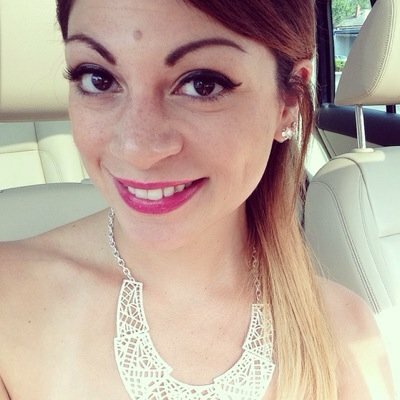 Did I ever stop imagining or putting ulterior connections together that others didn’t always see? Did my hunger for knowledge and learning ever cease? A widely shared opinion on the model of the traditional classroom is that it actually hinders creative thinking. I think we should re-examine how our kids are taught in school (very structured; math versus arts) and how adults structure the kids time at home (keeping children always busy with scheduled, structured activity with little time for mind-wanderings. E.g. I think [the neuroscience of creativity] is telling that most creative people are polygeniuses – equally gifted in art, science, invention (Leonardo da DaVinci is the best example). Yet now students of science/technology enroll in only courses related to that curriculum, stifling their more global mental gifts that might contribute to progress in fields related to literature and art." 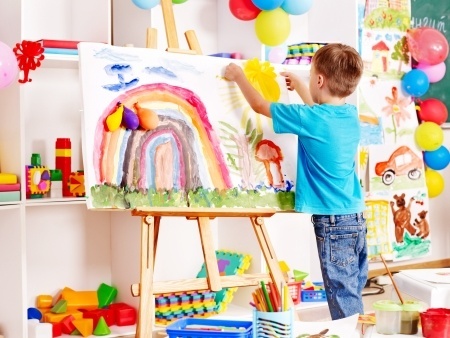 Ultimately, what do children possess that adults may not that allows their creativity to flourish? Children embrace their ignorance. A child isn’t afraid to be wrong. As adults we develop fear and anxiety about being wrong, failing, and ultimately embarrassing ourselves. By opening up, children are always learning what they need to know and building off the knowledge they gain from the many (many) questions they ask everyone. Children are always curious. In relation to lacking fear of failure, children are always curious! Being curious about everything allows children to consistently pick up tidbits of knowledge. As I pointed out earlier, more knowledge equals making more connections, which equals more creative ideas! Children use their imagination. According to a study conducted from 1959 to 1964 involving 350 children, around the 4th grade, a tendency to use imaginations to wonder and daydream abruptly declines. We should never stop allowing our minds to wander. We have to give that imagination network some time to do its thing and allow creativity to surface. At the end of the day, we all want more creativity. Divergent thinking, or “thinking outside the box,” is what could potentially land you that job over a more qualified candidate. In marketing, it’s what allows us to approach a tired old concept in a brand new way, or create something brand new that consumers didn’t even know they needed yet. I think today, we’re all looking for that “quick fix.” How can I be more creative right now? We all want that “lightbulb moment” we just spoke of in the illumination stage of the creative process. Well, as we know, it’s a process and it has no estimated length of time from preparation to illumination and beyond. However, there have been many studies that have pointed to the fact that creativity happens when we detach ourselves from conscious thinking (ah, yes, the Incubation Stage!). According to Professor Youakim, “It seems that when we are being perfectionists, we become extremely focused on the details or minutiae, whereas during our most creative times (or so the research suggests) we are in a most unfocused state, i.e. constraining certain ‘irrelevant’ trains of thought versus letting the mind free “to wander”. There are many suggested ways and places to have our best ideas, some being taking a shower (the famous idea breeder), laying down for a nap, taking a long walk, exercising, or even picking up a coloring book! Some I might add are doing the dishes and watching a movie your boyfriend insists on watching, but you have no interest in. Some of the greatest ideas and innovations came from the blending of perspectives. According to computer scientist Ramsey Nasser, “The members of a collaborative group make up a single meta-artist who is the sum of all their skills and the sum of all their perspectives in a way that you couldn’t possibly do as a single person.” I couldn’t agree more. Not only that, but holding a conversation with someone with a different perspective could seriously open your eyes and mind and take your idea on a new, exciting path. I’m an idea hoarder. I consistently keep notepad notes on my computer (and in physical notepads) and consistently email myself links and ideas or keep them in Trello. It’s actually pretty scattered. But, in my defense, I always end up remember the things I’ve documented. Write down your ideas when you have them - any little idea. Your mind might come back to it the next time it’s wandering, and I’d be willing to bet your notepad, post-it, or email comes to clear view. Studies continuously show us that drinking alcohol does in fact open up a creative state of mind by inhibiting those executive functions, and releasing reservations you might have had about your ideas beforehand. In one study, researchers at the University of Illinois at Chicago found that participants whose BAC (blood alcohol level) was slightly under .08 percent (the legal limit) performed better in a creative task than the sober participants. But don’t have too many soda pops, or else it could likely result in the opposite effect you were hoping for. Research has found that people are more likely to have a creative breakthrough if they were happy the day before. Spend time with people you love, have a productive day at work, read a good book, watch an uplifting movie, or play with a puppy. Everything in life seems better when we’re happy, and it could apparently also help heighten your creativity! I say this all the time; never stop learning. Develop a hunger for knowledge and creativity is sure to follow. How can you connect ideas about knowledge that you don’t possess yet? As I said, feed your brain, and you’ll be surprised what it’ll give back to you.